#7251 Smooshees Critter Cuddlers "Prancey Pony"
#7251 Smooshees Critter Cuddlers "Prancy Pony"
Description: The Prancy Pony set includes a Smooshee pony, and a small horse stable that the pony can be smooshed into. This is one of several friendly Smooshee pets called Critter Cuddlers that were sold with a natural habitat they can be smooshed into. Designed for children ages 4 years and older. 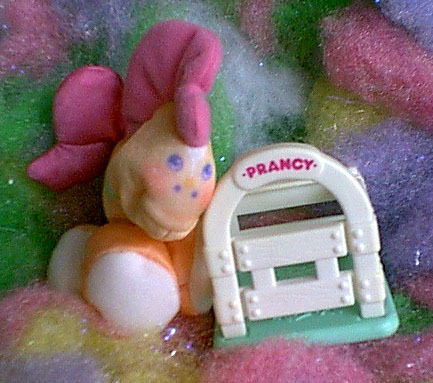 FPT14926 - Prancy Pony - Small peach-colored stuffed Smooshee pony with a printed face and other features. Pony has a pink mane and tail, purple eyes and nostrils, white and orange flowers around her neck, and white pads on the bottom of her feet. Pony is not marked with a model number, but was sold with a small sewn-on tag marked with a "S" for Smooshees. FPT14927 - Small horse stable with a flat green squared base, and white post sides. The front has an archway with "PRANCY" above the door in pink. The door does not open.